It is an entire pound of Gravlax! Acme Smoked Fish is a wholesale supplier of various kinds of smoked fish. That really great bagel place in your NYC neighborhood, they most likely stock Acme products. Located right in between Greenpoint and Williamsburg (the border argument can wait for another day), the factory sells its goods Friday mornings to the public. Since learning about this nearly three years ago, I have always wanted to buy a ridiculously large amount of smoked fish for a crowd but have never had this chance. However, as I was going away for the weekend with six other people, I finally got my chance. I got to the Acme warehouse around 9am Friday morning just as all of the factory workers were trickling in. They were all dressed in rain boots, fleece jackets, and hairnets. I wandered around the outside since the entrance was not clearly marked. Luckily one of the foremen noticed another hipster and myself looking lost and got us in the right door. The line wasn’t too terribly long, but it was slow moving since everyone wanted to sample everything they could. I wish I had pictures, but they weren’t allowed. Basically, a side of the warehouse is designated to sell to the public. There are tables of Acme products, from packaged to fresh. You could buy an entire smoked fish to take home! I went the less adventurous route and bought a pound of the regular Gravlax, which at wholesale prices was incredibly reasonable considering the quality. A really neat experience if you ever have the need to buy bulk smoked fish and some extra time on a Friday morning. I wouldn’t get there much after 9, the line just got longer and longer after me. After Acme, it was only a short walk to one of my favorite bagel places in the city, Bagel Smith, located near the Bedford L train. 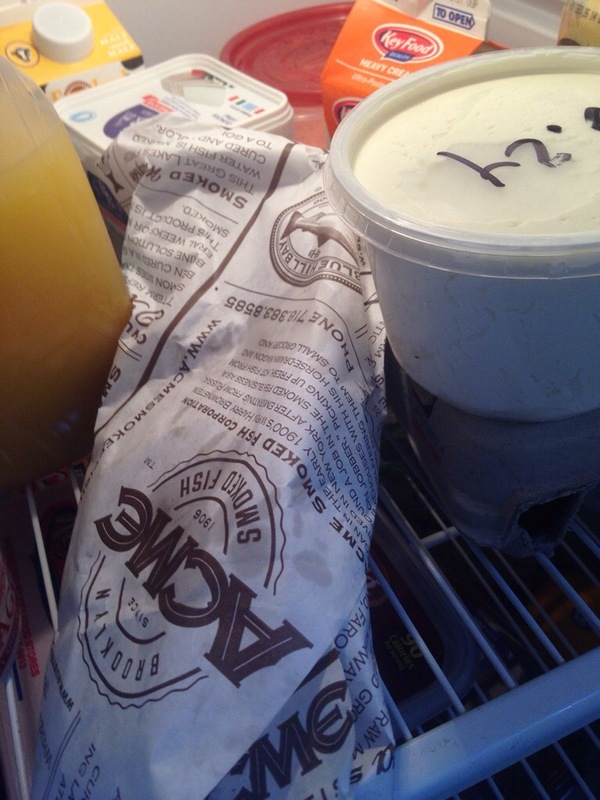 I got a pound of cream cheese, which you can see snuck into both pictures, and a dozen bagels (plus two free ones!). The cream cheese was so much fluffier and richer than the store tub cream cheese. Above, you can see the classic bagel I made Saturday morning. Luckily I remembered to take a picture before eating it all. 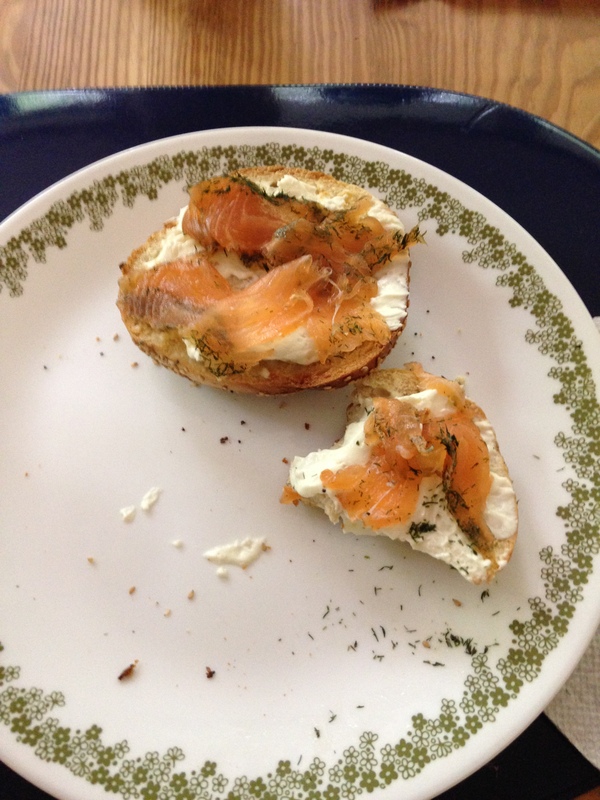 The gravlax was a perfect addition to my bagel. We also got more adventurous with these New York staples. For example, we put the lox in a salad. We also made bagel-esque burgers with the bun, patty, lox, cream cheese, onion, tomato, and pepper. It delicious! It felt a bit silly bringing so much New York to West Virginia but a great way to feed a crowd.